That rock you see above? It's 620 tons, over 2.5 times the weight of the Statue of Liberty. Yet some powerful wave in the North Atlantic was mighty enough to lift it out of the sea and plop it onto land. Everyday ocean waves are way more powerful than we ever thought: This is the conclusion of a fascinating paper by geoscientist Ronadh Cox and her research group. Scientists long knew there were unusually huge rocks hurled ashore around the world, but generally they assumed they'd been tossed up by tsunamis, rare tectonic events. Nope. It looks like regular 'ol storm-waves can manage these sorts of feats. 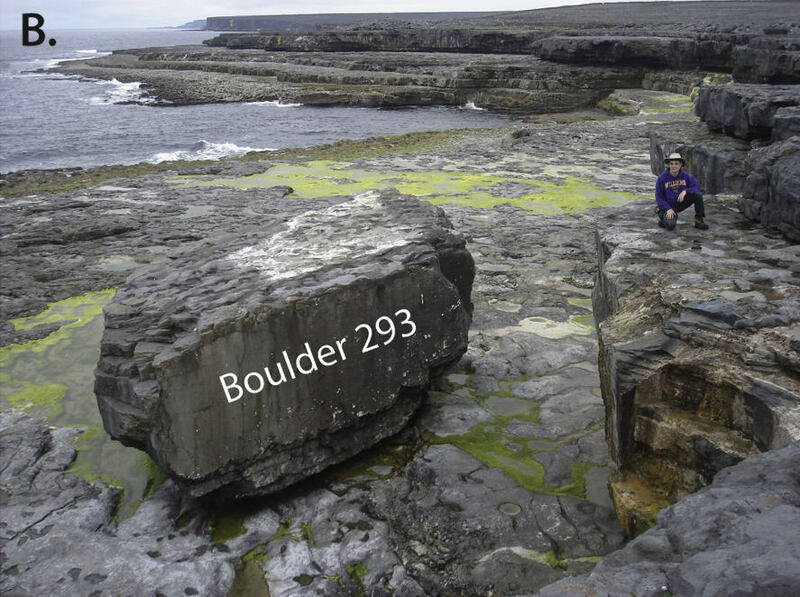 Cox and her group took a bunch of before-and-after photos of the northwest coast of Ireland around the time of a 2013-2014 storm cluster, and identified several boulders that the storms had thrown ashore. They were huuuuuuuge! No wonder Homer called Poseidon the "earth-shaker". The paper is here online in full, and is both layperson-parsable and seriously gripping. “Why bother with this study?” Cox knew members of the audience might be asking. If these deposits are formed by storms, then we can better understand storm dynamics and coastal processes. This information will be important as global climate changes cause storms to become more frequent and intense. The research could also help to constrain tsunami models elsewhere. “But from my perspective, it’s just cool. It’s just fun,” added Cox.